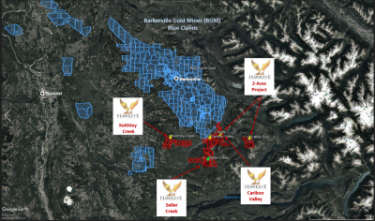 HAWKEYE has entered into a Sale and Purchase Agreement (SAPA) with the vendor of the Keithley Creek Project (the “Property”) to acquire a 100% interest in the 3,600 hectare Property situated approximately 30 kilometres south of the Town of Barkerville, BC, Canada. The Property lies within the southeasterly-striking Snowshoe Group of the Barkerville Terrane. This is the geological formation that hosts Barkerville Gold Mines’ (“BGM”) current gold mine development and exploration projects, including the Yanks Peak prospects, and also hosts a number of historic to recent placer gold mines within and adjacent to the Property. Keithley Creek, named after its discoverer ‘Doc’ Keithley, was one of the first major placer deposits of the Cariboo gold rush found in July 1860 and mining operations continued until 1998. Production from Keithley Creek was estimated at 275,000 ounces. 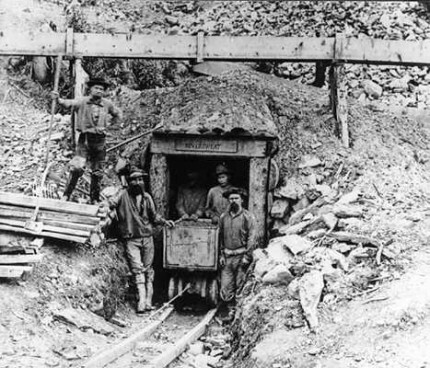 Barkerville became the centre of the historic Cariboo gold rush following the 1861-1862 discoveries on Lightning Creek, Williams Creek and the surrounding area. The recorded production estimate from 1861-1987 reported more than 5,000,000 ounces of gold which included 3,800,000 ounces from placer operations and 1,230,000 ounces from lode mining. Recently, BGM, the principal property holder in the district, has announced resource definition on lode gold projects and large exploration programs focused along the Cariboo Break, a structural corridor aligned with the principal NW to SE-directed high strain zones in the Barkerville Terrane. The lithologies are characterized by moderate to steeply dipping, southeasterly striking, locally overturned folds with northwesterly shear zones and plunging lineations, regional east-southeasterly striking thrust fault and later faulting along a general north-northeast direction. Gold mineralization to date is associated with quartz veins, iron carbonate (ankerite), and pyrite cutting amenable quartzite units of greenschist grade. Placer gold was derived from Tertiary age deep weathering of the vein deposits. Gold fineness exhibited a wide range consistent with multiple sources, or periods or styles of mineralization, including secondary precipitation. 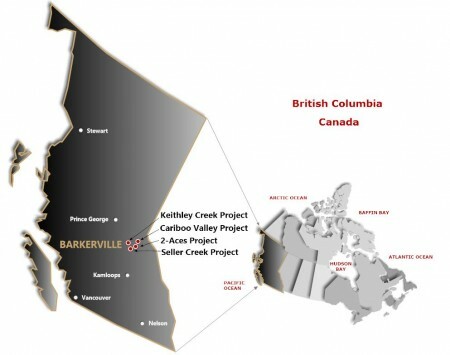 The Keithley Creek Property acquisition is subject to a $7,000.00 cash payment and the issuance of 50,000 shares and a further 250,000 share issuance should the project proceed to a pre-feasibility study. The Sale and Purchase Agreement between HAWKEYE and the Vendor for the Keithley Creek Property received TSX Venture acceptance for filing on September 29, 2017.